Mark is full of energy and passion--and it's noticeable right away. Mark flat out loves to DJ any chance he gets (the only thing Mark loves more is his family). 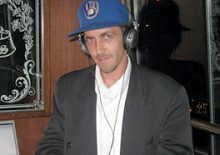 The best part about Mark is that he shares Madison Mobile DJ's vision to help people. The hug at the end of the night or a handshake for a job well done is the end goal. Mark always puts people first, and we love having Mark on the team. We're still trying to figure-out how to clone more just like him. Mark has always been loyal to his city of Milwaukee and it's sports teams. The Brewers, Bucks and Packers are all favorite pastimes for Mark when he's not DJing. I've been DJing since 2006 and have done 600+ positive weddings and zero negative weddings. This job takes passion--either you have it or don't. I'm also a DJ because I have a love for music and I know what works in different situations. I truly do it knowing that I make people's events, parties and weddings so much fun. I do it successfully because I ask the clients beforehand what they want (or a direction they want it) and give it to them. My favorite influence has been my friend Shane Bocksnick. He taught me how to DJ in 2006--he is great and taught me a lot. I give 100% of credit as to how I know what I'm doing when DJing as I watched him as we were put in multiple environments. He taught me that to know it all you have to experience it all. That knowledge is priceless! Hometown of Milwaukee and just turned 40 with a beautiful wife Crystal, two wonderful kids Alayna and Anthony, a dog (Lucky) and a cat (Maggie). Application/Electrical Engineer with 20 years of experience, associate degree in Electrical Engineering, bachelors degree in Management/Communications. Best event hands down was an event in 2012 in Racine, WI. All eight high schools had their prom on the same night, but had a merging event at the Racine war grounds. All eight schools prom after party event. Two DJs and light coordinator (my nephew). 1800 plus people, beautiful setting, everyone dressed to impress. Flawless event!!! To make everyone around me happy! Spend it with my kids and wife and do fun things. No matter what it is, from reading a book together or going to Disney World. To be successful in what I do. Be a good dad. Provide for my family. Pizza! I'm Italian. Balistreri's in Wauwatosa hands down is the best pizza. When you have 2TB (that's Tera Byte = 500,000 songs) of music, you don't have a go-to song. I go to what is needed when needed.